Yes! We know the feeling! 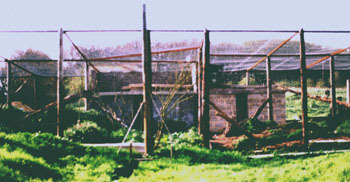 In the early 1990s The Cat Survival Trust bought its first new reserve in Misiones, Argentina. That reserve has now been adopted by the Misiones government as a Provincial Park, its initial population of around forty cats of five species has increased by almost a third and a very happy relationship has been established with the local people and their government. The Trust now has plans for about 300,000 acres of new reserves, spread through seven countries. Land prices vary, but the cost of setting up these new reserves will total millions of pounds. By protecting the land where cats live we also protect the millions of other life-forms living there. Cats, regardless of species, can live for fifteen to twenty years, sometimes longer. Unfortunately as they get older they are less attractive as zoo exhibits and they are then often disposed of - zoos are cash-starved too. Some of these cats come to spend the rest of their lives at the Trust’s headquarters in Hertfordshire, England, where they are given the best treatment our resources will allow. At present all our cat houses are full, some of the cats would benefit from more space and we urgently need to build more housing especially for our bigger cats such as lynxes and snow leopards. The cost of this work will run into tens of thousands of pounds, but even hundreds would allow us to make progress. Much of our food bill is sponsored by an animal food and accessories business which shares our site, but with so many cats waiting to be rescued the total will soon outstrip what can be provided from that source. Veterinary fees have so far been low, mainly because of good husbandry and the fact that most of the ailments from which the cats suffer are treated homoeopathically by our Director, who is a homoeopathic doctor. With more cats arriving, often from uncertain backgrounds, this situation may soon change. Talks are given to schools and other interested groups in which we try to increase their awareness of the needs, not just of wild cats but of the whole environment in which both they and we live. Many of these people, especially those in deprived areas, cannot afford to pay fees or expenses. Others talk - we get on with the job! Cash donations may be handed in at our headquarters (address below); cheques should be made payable to The Cat Survival Trust. Telephone or postal payments may be made using the following credit/debit cards: Visa, Access, Mastercard, American Express, Optima, Connect, Switch, Electron, JCB. Corporate donors and those giving large amounts are asked to contact us by one of the ways shown on the contact page.